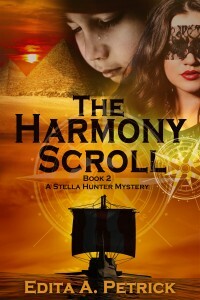 Stella Hunter sets out to find the Harmony Scroll that history claims is capable of removing the Peacetaker curse from the child’s head. The fact that the last time the scroll has been seen was in Alexandria, being loaded on to a ship more than a thousand years ago is not a deterrent. After all, to what lengths wouldn’t a mother go to remove a horrible curse from her child’s head…seek help from her arch-enemy, track down an old text disavowed by the Vatican, walk into a fortress owned by an ex-KGB agent-turned-entrepreneur, bravely face an evil corporate lawyer who fancies herself an archer, or ignore the fact she’s pursued by a man who has been dead to the world for the last eight years?